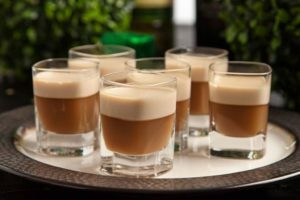 Since Ms Lyn Hancher mentioned Irish Coffee, and the lack thereof, on Facebook, we launched a minor investigation – needless to say, we came up short. We really couldn’t find restaurants/coffee shops that actually made these (to be fair, we only checked South West London, but the fact remains). Considering the proximity to Ireland, we found this slightly ironic, but decided to take matters into our own hands. So here’s our take on an ultimate indulgence. Start by brewing your coffee in a plunger or coffee maker. While that’s going, add brown sugar to your Irish Coffee Cup or any other mug/glass. Once done, pour your fresh brew into your cup, before adding the whiskey. Stir well and add your heavy cream to the top. Add some chocolate shavings to the top for ultimate indulgence or enjoy as is.